This year I have had the honor to edit the stories of caregivers to create a series of books for Caregiving.com. The books are a fundraising project for the CareGifters program which sends $500 to a caregiver in need as often as possible. Many, many caregivers have been helped with a variety of needs and it is extremely rewarding to be a part of this project. 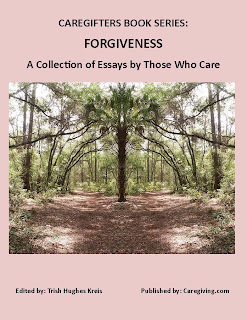 The most recent book is about forgiveness and the stories are from people in varying stages of forgiveness. Beautiful photographs are sprinkled throughout the book amidst these poignant stories. 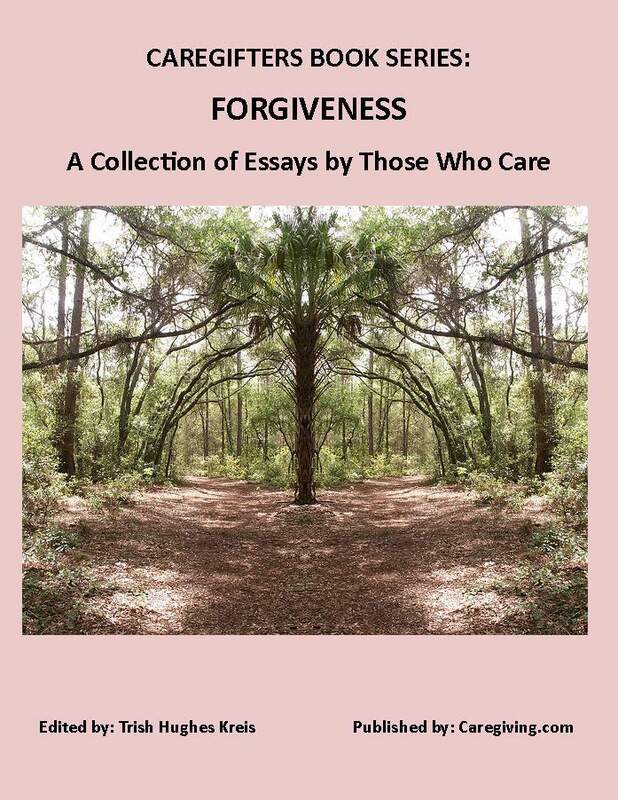 I’m sharing one of my essays on forgiveness here as I have struggled with forgiving my dad for not choosing treatment for his kidney failure. If you would like to purchase a copy of the book (the eBook is only $5), please visit here. You can be confident your purchase of the book will go toward helping another caregiver who doesn’t know where to turn. The most recent CareGifters recipient was extremely stressed because she had been diagnosed with cancer and needed surgery yet was a full-time caregiver for her husband. She didn’t know how she could afford to hire care for her husband while she was in the hospital. This money allowed her to get the help she needed giving her peace of mind before her surgery. My own stories of forgiveness (Before Forgiveness and Letting Go . . . Finding Forgiveness) are just two of many stories in the book. "Unfortunately, his paranoia stretched to include doctors and other health professionals. When he was very sick he would see a doctor to get pain pills but wouldn't follow their advice about his kidney failure. He was bluntly told if he didn’t go on dialysis his kidneys would fail and he would die within six months. Several years prior to this he had a terrible bout of Bladder Cancer for which he was treated with chemotherapy, radiation and finally, removal of his bladder and prostate. Dad became convinced the surgery was unnecessary and the doctors only removed his bladder and prostate to remove him from the dating pool so they would have less competition. Right. Because the right to date is squeezed in just before the "do no harm" sentence in the Hippocratic Oath. When told of the kidney failure, he refused to see an oncologist to see if his cancer had returned to infiltrate his kidneys. He had extreme back pain and only wanted pain pills. He refused to connect his back pain to his failing kidneys. He wouldn't let me attend his doctor's appointments because he knew I'd force him into treatment and he said he didn't want to be mad at me. He steadfastly refused dialysis because he didn’t want to live hooked up to a machine. He told me the only way he would ever allow dialysis was if he was in a coma and going to die that very day. He told me I could make that decision if it came down to it. I told him I didn't think that dialysis would work once it got that dire and he should talk to his doctor about it and not put me in such a position." I have a difficult time with forgiveness but not because I’m an unforgiving person (really, I’m not). I don’t know that I have any right to forgive someone for something they did that, while hurtful, was unintentionally so (most of the time). Another piece to this forgiveness quandary I am in is that it is closely tied to letting go. Me, who envisions a future involving several cats and boxes and boxes of the kids’ drawings from pre/elementary/middle/high school as well as a good amount of pictures and books. Oh, wait. That sounds eerily like my present. Okay, so I may have a letting go problem. Maybe. If I have a letting go problem do I also have a forgiveness problem? I don’t feel the need to forgive my parents for the decisions they made when I was growing up. My brothers and I were loved and our parents were trying the best they could. They were young and went through mental health issues (depressions, bipolar disorder). I’ve long since accepted them for who they were. They didn’t intentionally hurt us kids so there’s nothing to forgive. Somehow, I can even let go of the difficulties depression brought into our lives, probably because it was something Mom worked to overcome. She eventually stopped trying to give up. Recently, I was listening to Anna Stookey who is a regular on the internet radio show, Your Caregiving Journey with Denise M. Brown. Anna and Denise were talking about letting go. A comment sent a jolt through me: it is perceived as a failure when we let go." I hope you are able to check out the book. I'd also love to hear your own stories of forgiveness so please feel free to share them in the comment section. We all have stories to tell!